Saint Petersburg National Research University of Information Technologies, Mechanics and Optics (ITMO University) is one of the oldest educational institutions in Russia. It was founded on March 26, 1900, by the decree of Emperor Nicholas II as the Mechanical and Optical Department of the Prince Nicholas Vocational School. 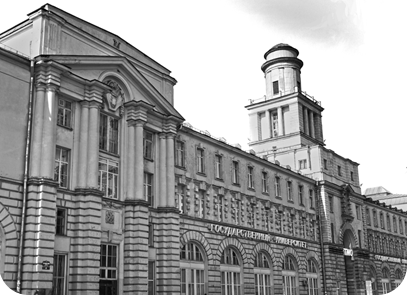 Professional training of specialists began in 1900, with the creation of St. Petersburg Vocational School with optical, mechanical and clock departments. Later it was transformed into the Leningrad College of Fine Mechanics and Optics (1920), and then into the Leningrad Institute of Fine Mechanics and Optics (LIFMO) (1930). Over the years, the Institute developed as a technical college for engineers of a wide range of specialties. In 1980, LIFMO was awarded the Order of the Red Banner for achievements in training of highly qualified specialists for the national economy and the development of scientific research. In 1994, the Institute was given the status of a technical university due to results of the State certification, and in 1998, 2003, 2008 and 2012, the status of the University was reconfirmed. Currently, ITMO is one of the leading universities in Russia. In 2007, it became the winner of the innovative educational program of universities in Russia for 2007-2008. The implementation of the innovative educational program has allowed us to reach a completely new level of training, and meet the growing demand for professionals in the informational, optical, and other high-tech industries. In 2009, the University became the winner of the multi-stage competition among the leading Russian universities, which resulted in acquiring the status of "National Research University." By the order of the Ministry of Science and Higher Education of the Russian Federation, a program for the development of the university for the period of 2009-2018 has been approved. In 2011, the University was renamed into St. Petersburg National Research University of Information Technologies, Mechanics and Optics. Over the last decade, Academy of Management Methods and Technologies (LIMTU) was added to the ITMO structure as well as Interdisciplinary Institute of Professional Training in New Areas of Science and Technology and the State Scientific Institution Republican Scientific Center of Computer Telecommunication Networks of Higher Education, followed by St. Petersburg College of Marine Instrument Making, St. Petersburg State University of Refrigeration and Biotechnology and St. Petersburg Economic and Technological College of D.I. Mendeleev.